The repair of York Minster’s Great East Window was a key part of a larger programme of repair and conservation to the Minster’s east front, which commenced in 2006. 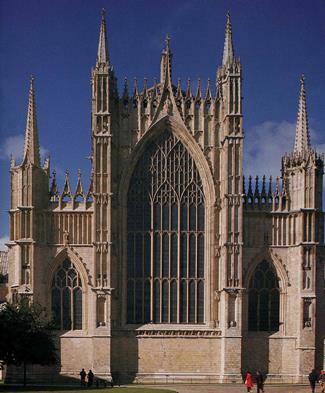 It was completed under the subsequent York Minster Revealed project, which received generous HLF funding of £10 million. The cost of fabric repair (masonry and glass) amounted to approximately half of the overall £20 million project cost. York Minster Revealed was a five year project, allowing sufficient time for the remainder of the east front masonry to be repaired and conserved and for the Great East Window glass (and the windows of the adjoining fenestration) to be removed, conserved and then reinstated incorporating a new protective glazing system. Other parts of the project focussed on improving visitor facilities, creating a new below-ground exhibition space in the undercroft and forming a new approach piazza outside the south side of the Minster. The Great East Window of York Minster, made between 1405 and 1408, is the largest expanse of medieval stained glass in England and one of the most ambitious glazing projects ever undertaken. Depicting the beginning and the end of the Christian cosmos, from the Creation in the Book of Genesis to the Apocalypse and the Second Coming of Christ, it summarises the medieval perception of human history, which unfolds under the feet of God the Father (top) and the company of heaven. While the Apocalypse had been a popular subject in illuminated manuscripts, to depict it in glass and on this scale was extremely daring. The Chapter of York looked outside the city for someone with design abilities and entrepreneurial skills equal to the task and in 1405 contracted with the Coventry glazier John Thornton. While Thornton was required to paint only some of the glass himself, the contract stipulated that he was to ‘cartoon’ every single one of over 300 panels entirely with his own hand which, in the Middle Ages, meant marking up full-size working drawings on the whitened glazier’s table. The complexity of the Apocalypse subject matter, in which each scene is a unique narrative, made this a particularly challenging undertaking, and while recent research by Professor Nigel Morgan has demonstrated Thornton’s familiarity with other Apocalypse imagery, the window is characterised by the originality and freshness of Thornton’s approach to the subject. The window was last restored between 1946 and 1953 under the direction of Dean Eric Milner-White. With scant regard for the efforts of earlier restorers, Milner-White set about reordering glass within individual panels, removing many earlier restoration insertions. Inadequate art historical research meant that some scenes were misidentified so that they were incorrectly restored ( see illustrations of Panel 5b below) and returned to the window in the wrong location. The many holes opened up by the removal of 18th- and early 19th-century stopgaps were filled with pieces of unpainted coloured glass, an honest repair which was easily distinguished but visually very disturbing. The most aesthetically destructive aspect of the restoration was the use of thick (10-12mm) leads throughout the window, darkening the panels and disguising the delicate relationship between glass and lead achieved by Thornton and his collaborators. 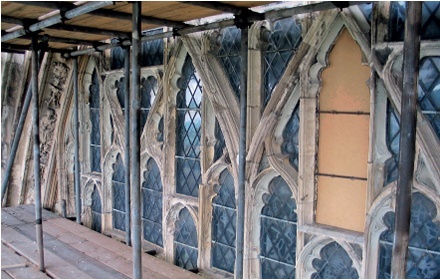 Exploratory conservation trials undertaken by the York Glaziers Trust (YGT) between 2005 and 2008 reviewed a number of conservation options, ranging from a light overall clean, to the dismantling and full conservation of the panels, with the recovery of John Thornton’s cutline as one of several objectives. However, one over-riding priority was to install state-of-the-art ventilated protective (isothermal) glazing. In step with the guidelines of the International Corpus Vitrearum (see Recommended Reading), no dismantling, reordering or restoration could be justified without thorough research. As a result, the forensic examination and recording of every piece of glass has been complemented throughout the project by in-depth exploration of the antiquarian and art historical context of the window. The discovery of drawings and photographs dating from the 1730s, 1880s and c1939 has been essential to understanding the restoration history of the window. Above all, the meticulous description compiled in the 1690s by antiquary James Torre has not only shed light on individual panels, but has confirmed the original panel order of this immense biblical narrative. 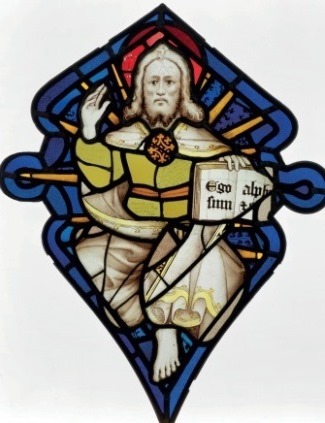 After long and detailed consultation with the Cathedral Fabric Commission for England and other statutory consultees, the Minster decided to proceed with the dismantling, conservation and reglazing of the window. This process was supported throughout by the guidance of Chapter’s East Window Advisory Group. After careful cleaning to remove hygroscopic dirt, the dismantled glass pieces were closely examined for evidence of their original location in the panel. Clues provided by edges which had been ‘grozed’ by the medieval glaziers (nibbled away with a hooked tool to fit snugly into the lead) were always invaluable evidence of authenticity and relationship to adjoining pieces. Also, indications of glass structure, corrosion patterns and traces of lost paint, observable through a binocular microscope, often confirmed the evidence of surviving painted detail, allowing multi-fractured and heavily corroded pieces to be reunited. Mending leads in obtrusive or lightly coloured areas have been removed whenever possible. The epoxy resins Araldite 2020 and Hxtal NYL-1 have both been used for edge-bonding, depending on the condition of the glass and the nature of the fracture. 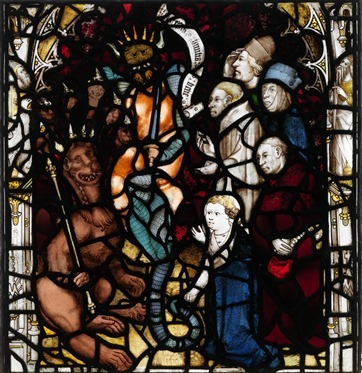 Panel 5b following incorrect restoration by Dean Milner-White, who inserted a second beast in the centre of the panel constructed from miscellaneous fragments The panel following conservation in 2013: ‘And they adored the beast, saying ‘Who is like to the beast? And who shall be able to fight against him?’ (Revelation 13: 4-6). Detailed criteria have been used to determine whether later stopgaps should be retained or removed, and those removed from the window have been recorded and retained as part of the project archive. Every process and decision has been meticulously recorded and new methods of digital documentation have been developed specifically for this project. From the outset the East Window Advisory Group was clear in its view that the provision of protective glazing was the single most important contribution that modern conservation could make to the preservation of John Thornton’s medieval masterpiece. In 1861 the Great East Window was provided with crude exterior glazing, first in the form of single sheets of glass and later by diamond panes or ‘quarries’. Two new glazing grooves were cut into the window mullions of the main lights. The exterior glazing was mortared into the outer groove. The original glazing position was abandoned and the stained glass was set into the new inner groove. The window was effectively double-glazed, with no ventilation between the outer and inner glazing. Advances in protective glazing design have demonstrated the importance of ventilation and this project provided the opportunity to significantly improve the system. The new protection of the Great East Window will take advantage of the additional exterior glazing groove, but the system is governed by the principles of modern isothermal protective glazing (see diagram opposite). An interspace of c50mm and gaps at the top and bottom of each light allow a constant air flow between the protective glass and the historic stained glass, ensuring that both surfaces of the medieval glass are kept dry. Although the efficacy of this kind of protective glazing has been tested in projects all over Europe (Bernardi et al, see Recommended Reading), the design of the east window installation was also informed by a year of environmental monitoring undertaken by Ivo Rauch. A major development has been the decision to use Glashütte Lambert’s Restauro UV glass for the exterior glazing, a mouth-blown cylinder glass that incorporates effective UV protection up to 405nm. Restauro UV handles like any other mouth-blown antique glass but also protects light-sensitive materials, notably the epoxy resins used in edge-bonding, against light-induced alteration or discolouration. York Minster is the first building in the UK to use this extraordinary new glass. The new protective glazing system, designed by YGT’s senior conservator Nick Teed and surveyor of the fabric Andrew Arrol, has eschewed the ferrous materials which can cause damage to stone, working with compatible bronze alloys that minimise the risk of bi-metallic corrosion. McKechnie Brass’s bronze composition Alloy 300 is being used for the manufacture of frames for the medieval glass, the integral support bars, T-bars and the rods from which the glazing pins are made. New T-bars will support both the exterior glazing and the medieval panels, each nearly one metre square. The exterior glazing is seated on a T-bar and is mortared into the stone in the traditional manner. Each medieval panel will sit on an inner row of T-bars, and will be held firmly in place on the ledge of the bar with bronze pins. For safety, exhibition or future conservation, panels can therefore be removed easily and safely from an interior scaffold, leaving the exterior glazing in place as an effective weathershield. The medieval panels are framed in bronze Alloy 300 U-channel. YGT’s Nick Teed has developed a new framing method which has moved away from the hot-working methods commonly used to connect components of the panel frames. Only traditional tin solder can be worked at a sufficiently low temperature to be used in proximity to medieval glass but YGT was seeking a stronger bond. The simple screw-fixed frame that Teed has developed can be assembled around the panel of historic glass, allowing maximum precision, greatly increased strength and an entirely reversible and recyclable use of expensive metal components. The masonry repair project began with a meticulous stone-by-stone assessment of the fabric leading to the compilation of detailed proposals for repair, replacement and conservation which had to be submitted to the Cathedrals Fabric Commission for England for approval. From the outset the project was seen as a holistic design exercise, incorporating design considerations for the protective glazing and the integration of the conserved glass panels into the masonry work. A very careful assessment was made of the overall geometry of the east front and in particular the distorted geometry of the window masonry, which leans out at an angle of approximately 2° from the vertical in an easterly direction. North-south movement (across the window) has also resulted in a 35mm wide crack at the head of the window. This, however, is relatively small, particularly compared to the overall outward tilt of the east front, which would have amounted to almost 1 metre had the upper parts of the facade not been reconstructed during the 18th and 19th centuries. to design and carve a new seated St Peter figure, which required a great deal of consultation and discussion. The basic building stone of the Minster is magnesian limestone which, over the years, has been sourced from several different local quarries. The original quarry source was Thevesdale, not far from Tadcaster where the current quarry source for the majority of Minster stone is located. Other historic quarry sources of magnesian limestone were the Huddleston group of quarries and the Bramham group of quarries. Stone is also taken from Warmsworth and has in the past also been supplied from Cadeby. After detailed testing of previous medieval stone types and an assessment of contemporary quarry sources, the stone from Tadcaster has been selected as the preferred replacement stone with the best match to medieval stone. The pointing and bedding mix is made up of naturally hydraulic lime (NHL 3.5, usually St Astier). The standard mix for general pointing uses one part sieved washed river sand (Nosterfield), one part Leighton Buzzard sand, one part South Cave sand and one part NHL 3.5 St Astier. This mix provides an extremely well-graded aggregate proportion which bears a very close resemblance to the colour and technical performance of the historic mortars used at the Minster. 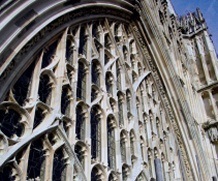 Where necessary wide joints are ‘galleted’ using shards of oyster shells to fill the gaps and reduce the area of mortar exposed to the weather, closely following earlier examples found on the Minster, some of which date from the medieval period. The full size drawings and templating for every individual piece of stone were prepared by the Minster’s master mason and geometry and carving details were agreed with the surveyor of the fabric. The work was carried out in accordance with the ‘Current Stone Practice’ document, prepared by the surveyor of the fabric. The document sets out a detailed methodology and specification for both conservation and new work. 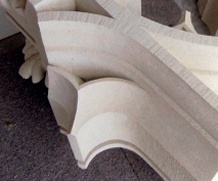 Left: detail of a new tracery section ready for indenting (note grozed chisel finish to all surfaces). Right: Upper part of the Great East Window with masonry complete and protective glass in place. The new tracery indents were secured in place using lead-poured joints, a technique used in the Middle Ages to create a rigid joint. These were then pointed up with the standard mortar. The surface tooling of all new stonework followed established medieval practice and all surfaces were carefully worked using a ‘grozed edge’ chisel, a form of claw chisel. Almost every surface of the building was covered externally with linseed oil during the 19th century and this has led to a surface consolidation process which can trap salts and sulphates in the outer zone of all external masonry elements. After a while this develops into a kind of ‘potato crisp’ which then snaps and breaks off. Such surfaces were carefully cleaned with distilled water then stabilised with up to six applications of nano lime followed by shelter coating using limewashes emulsified with casein and a small amount of ochre pigment. The design of individual tracery elements involves a great deal of lobe and cusp work and many of the cusps and tracery profiles were missing as a result of weather and fire damage over the years. Although traditional lime-based mortars are used for weathering and filling, where profiles need to be restored and/or rebuilt, a repair mortar with a greater degree of slump resistance is needed. Keim’s Restauro mortar system met this requirement well and the mortar can be chiselled and dressed when it has hardened. The product’s porosity and breathability also closely match those of the host stone. Lost profiles have therefore been rebuilt using these mortars with careful colour matching, and reinforced with either stainless steel wire or hollow ceramic dowels. 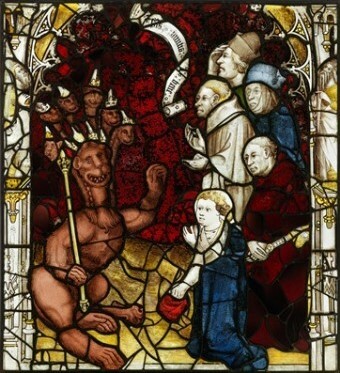 John Thornton’s 300-panel representation of the biblical Apocalypse in medieval stained glass was a ground-breaking achievement. The task of meticulously recording, conserving and reinstating the Great East Window’s stained glass and stonework has brought together art historians, archaeologists, conservators and craftspeople. One of Europe’s largest and most complex conservation projects, the scale and success of this collaboration echoes that of Thornton and those who worked alongside him. And the results speak for themselves, as the quality and sophistication of John Thornton’s monumental design have re-emerged from centuries of obscurity, no longer ‘a glorious wreck’ but a magnificent work of art. ANDREW ARROL is surveyor of the fabric for York Minster and a partner of Arrol & Snell Ltd. SARAH BROWN is director of the York Glaziers Trust.